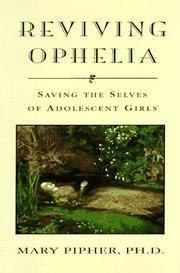  Clinical psychologist Pipher turns her attention to female adolescence in contemporary America. Pipher examines not just the girls themselves but the society they inhabit, which she terms ``girl-poisoning.'' Looking at why a generation of girls who ought to have benefited from the women's movement are losing rather than gaining self-esteem as they become women, she takes on divorce, eating disorders, self-mutilation, sexual pressure, and MTV, among other things. She also posits that intelligent girls are more prone to depression because they are more aware of their surroundings and therefore more aware of the new constraints they face as they leave childhood. Pipher integrates literature, memoirs, and memories of her own adolescence and that of her daughter; she also has a deft way of summing up psychological phenomena in layperson's terms, as when she dubs the changes that girls go through ``a social and developmental Bermuda Triangle.'' The summaries of her own sessions with adolescent girls add liveliness as well. Some of the patients have laserlike insight into their own situations, like the depressed 15-year-old who muses that at her age ``[a]ll five hundred boys want to go out with the same ten anorexic girls.' '' Serious and thoughtful material presented with the fluidity of good fiction--sure to appeal to parents, teachers, and anyone interested in modern American culture.